Dating is much more fast paced than it used to be before dating apps became a thing. People can find someone online and go on dates with them the very next day. While that may be deemed spontaneous, there is no denying the inherent risks. Online background checking services offer a simple way to minimize those risks, but it’s often frowned upon by the dating community. In this post, we talk about why it should be an essential step before going on blind dates. Here’s the blunt truth. People lie a lot on the internet. From photoshopping profile pictures to more serious offences such as hiding criminal records, the online dating community is packed full of people who routinely misrepresent themselves. People also commonly lie about their sexual orientations and gender. Online misrepresentation is so rampant that it has spawned entire TV shows like Catfish that try to reveal the truth. Checking someone’s criminal records and background information is as simple as going to a website and typing that person’s name. There are more than a few reputable background check websites that can pull up a person’s criminal history, relationship status, and other critical details in a matter of minutes. Veromi is one of the more popular background checking services. The site has an easy sign-up process and it searches multiple databases to deliver a comprehensive report. The entire process is online and the reports are easy to understand. No, it’s not. Mainly because trust is something that builds up overtime. People spend time with each other and earn each other's trust. This means if you are going on a blind date you simply haven’t invested enough time to build any kind of trust with the other person. Therefore, it’s never a breach of trust if you decide to background check your date. Similarly, you should also be open to your date performing a check on you. There are more than a few blind date horror stories that justify the importance of background checks. A Buzzfeed article talks about a particularly disturbing one. One woman recalled the story of her going out with a “sketchy” guy. While they were on the date, the guy went out for a smoke break. The woman saw the guy talking to an unknown person through the window of the diner. Upon enquiry, the guy simply replied that he sells meth part time. While his answer was honest, it was also disturbing. If you are still not convinced, the following are 4 reasons you should always perform a background check before going on a blind date. Prevent Wasting Time and Money on The Wrong Person: Weekends are precious and they are too far apart to be wasted on a bad date. Performing an online background check allows you to figure out if the person you are going out with deserves your time or not. Stories of married individuals misrepresenting themselves as single people are all too common. Background checks help you filter out the fakers. You Avoid Getting Emotionally Hurt: When it comes to finding out an ugly truth it’s always best to do it as early as possible. People often find it difficult to detach themselves from individuals if they get emotionally involved. By performing a background check before you go on a date, you avoid the emotional trauma that would otherwise be inevitable if you are forced to break up with that person after a few months of dating. Increased Chances of Finding Someone Special: Finding the perfect romantic partner is all about trial and error. By screening out the fakers, liars, and the criminals, you automatically give yourself a better chance of finding someone truly special. Background Checking is Super Easy: Have you ever seen FBI agents on TV trying to search criminal databases. That looks pretty complicated, right? Well, background checking in real life is far simpler. Websites like Veromi has simple user interfaces that require minimal information to get started. Long story short, if you know how to check your mails you shouldn’t face any trouble performing background checks online. It’s also super-fast. From the time you type in your date’s name, it takes less than a minute to generate a full report. Before internet dating websites and apps became popular, people used to meet other people in social gatherings. More often than not, through common friends. The act of dating complete strangers was not really popular. With the popularization of dating apps, you could meet people who are outside your circle of friends and are essentially complete strangers. While there is a certain sense of bravado in this approach, online dating comes with its share of risks. 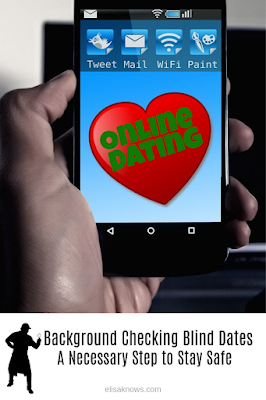 Background checking your blind date is just a practical and simple way to stay safe.